With a sharp knife, trim the top layer of fat from the rib if needed. Score the top of each rib by cutting grooves (¼-inch deep) perpendicular to the rib bone every ½-inch. These cuts will provide more surface area for the flavorful rub. In a small bowl, mix the dry rub ingredients. Apply a generous coat of dry rub to all sides of each rib. Build a charcoal fire on one side of grill, such that the coals are situated on only one side of the grill, leaving the other side void. This will create an area for lower temperature, indirect cooking away from the coals. 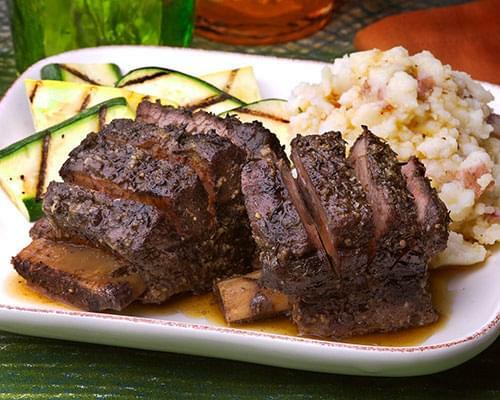 Place beef ribs on the grill (bone side down) away from the coals and cook with indirect heat (approximately 275˚F) for 1½ hours, or until internal temperature of beef reaches 160˚F. Remove ribs from grill and place them in the center of a doubled sheet of aluminum foil with meat side facing down. Pour stock mixture over ribs and wrap tight in foil, trapping juice inside. Return the foil pack to the grill for 1 hour, or until internal temperature of beef reaches 200˚F. Remove foil package from grill and let beef rest in the foil for 15 minutes before removing. Slice each rib to the bone at scored cuts. Reserve some au jus to drizzle over beef or to season side dishes, such as mashed potatoes. The hickory adds just the right amount of smoke to the already bold beef rib. Credit: Recipe created by world champion pitmaster, Chris Lilly on behalf of Kingsford® charcoal.